A genuine super-oil, the number of ways to use lavender essential oil seems endless! I’ve been using essential oils for many years and have tried a lot of different brands. Lavender has always been my absolute favourite and I’ve since found a ton of different ways to use lavender essential oil. I can’t deny that I get a bit giddy about it and I want everyone that I love to discover how amazing it is. It’s soothing, calming, kicks stress to the curb, and has a ton of health benefits. 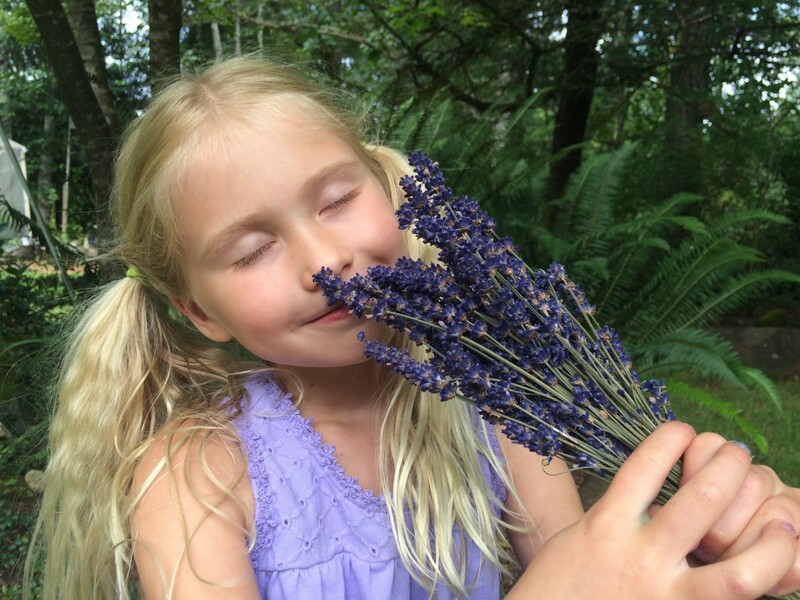 Recently my niece, who is only 7-years-old, has also jumped on the lavender train. When she stayed with me for a week, she insisted on sleeping with one of my diffusers in her bedroom each night. Now she has made a few of my tips below part of her bedtime routine, and it’s become a really special bond for the two of us. Using essential oils doesn’t need to be complicated. These are the top 10 super-simple ways I use lavender essential oil each and every day. Bedtime Routine – Gently rub lavender oil on the bottoms of your feet, place one or two drops on your pillow, or diffuse it at bedtime for a soothing, restful sleep. I like to blend lavender with cedarwood, bergamot, or arborvitae essential oils. Headache Relief – A drop of lavender oil rubbed into your temples can be extremely effective. I like to toss a rollerball in my purse that I make myself: 10 drops of lavender, 10 drops of peppermint, 10 drops of frankincense, and topped up with fractionated coconut oil. Bath Time – Scoop two cups of epsom salts with 7 – 10 drops of lavender essential oil into a warm bath for an absolute stress buster. Deep Hair Conditioner – Stir up some softness with 2 tablespoons coconut oil, 1 tablespoon of olive oil, and 8 drops of lavender oil. Your dry, damaged hair will thank you. Take the Sting Out – My niece received her first bee sting two days ago. Massaging a couple drops of lavender oil into the sting quickly reduced the redness and swelling. Impress Your Guests – I recently made this sparkling lavender lemonade for a group of girlfriends and it was a huge hit! Everyone was asking for the recipe and the flavour was outstanding. Nature’s Chill Pill – Inhaling lavender essential oil sends it directly to the emotional dashboard in your brain (also known as the amygdala gland). Lavender creates a quick calm, perfect for travel, stressful moments at work, or awkward social situations. Itchiness – Because lavender is anti-inflammatory, anti-viral, and anti-bacterial, it’s great for combining with a bit of coconut oil to relieve eczema, inflammation, and even cuts and scrapes. Acne and the T-Zone – Add a couple drops of lavender oil to your facial cleaner or moisturizer to support the reduction of redness and inflammation of acne. Or do as I do and whip up a non-toxic, DIY mud mask: Make a paste with 2 teaspoons of bentonite clay, 1/2 teaspoon apple cider vinegar, 1-1/2 teaspoons of water, 1 drop of lavender oil, 1 drop of frankincense oil, and 1 drop of tea tree oil. Massage – A few drops of lavender oil in some jojoba, almond, or fractionated coconut oil is your achey muscles’ best friend. It absorbs quickly and the oil’s anti-inflammation properties can provide much-needed relief. Trust me – if incorporating these into my daily routine wasn’t easy and effective, I wouldn’t be wasting my time. If you’re new to essential oils, I’d recommend that you find just one or two ways to use lavender essential oil. It’s a complex, rich oil that I can’t get through a day without in one way or another. If you want to know more about the brand I trust and personally use, I’d love to chat with you! Just send me an email to learn more and find out where to buy them.